Advertisements have several steps, they may either be totally ‘electronic media’ based, or can be done through posters, billboards and outdoor publicity/promotions. Usually buildings and busses are used as an emblem for advertisements. Because they attract people towards them and whenever someone is on road he would for sure take a little while to look at the blinking boards or posters/sign that what it is all about. This may also serve as a building block suffice for a healthy marketing strategy and also develops a good impression to show one’s professionalism. In the market and corporate world people struggle a lot more to get the views and an advertisement helps them to showcase their brand products etc. 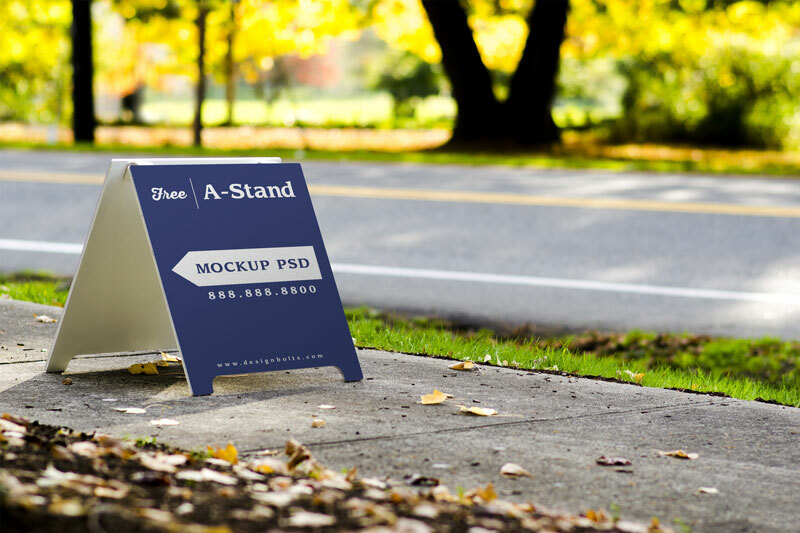 Down here you will see a free outdoor advertising roadside A-Stand mockup in which you may insert in the elements you have made for the respective shop/brand. The logo, name or stuff inside the shop can be written on it. Basically it may also serve as a store locator or as a direction sign to draw people towards it. People use many mediums to inform the masses about their work capabilities and stance. Advertisement is one of those mediums that has worked wonders for owners and business firms. I am sure you will create a stunning presentation out of this mockup. Also do let us know what sorts of mockups you are looking forward to so we may develop them for your ease and comfort. We know how important it is to have handful of design items that may help in making quick design pieces for clients. Mockups are certainly the best readily available rescue compartments for designers no matter how much they are capable of doing everything on their own, no matter how expert they are or they are pretty helpful for beginners and the newbies. For more amazing design dose and graphic feed you must not forget to subscribe us. We love to hear from you guys. Here we go.